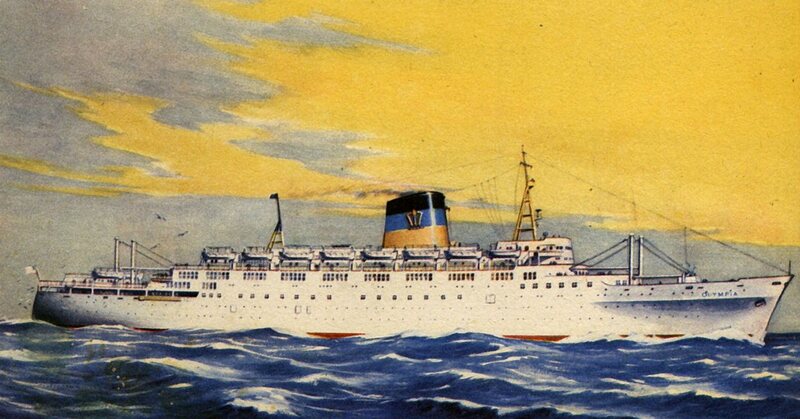 One of the longest serving passenger ships in history, and the only ship expressly built for the Greek Line was initially named Olympia. Olympia was completed by Alexander Stephen & Sons, on the River Clyde, in 1953. She was initially measured at 22,979 gross register tons (GRT), and carried 138 First Class, and 1169 Tourist Class passengers. She was registered in Liberia. Parsons turbines of 25,000 shp drove her at a service speed of 21 knots (23 knots maximum). The maiden voyage left Glasgow for Liverpool and New York on October 20, 1953. Her first voyage on the intended route from Piraeus to New York as an ocean liner did not take place until March 1955 due to legal complications. In 1961, the route was extended to Haifa, Israel. Her voyages to New York usually included numerous intermediary stops. Olympia was a frequent caller with immigrant families to Pier 21 in Halifax, Nova Scotia making 86 calls at Halifax. In 1968, Olympia was registered in Greece, and spent an increasing number of voyages cruising, this becoming her exclusive occupation in 1970. By this time she had been re-measured at 17,400 GRT. 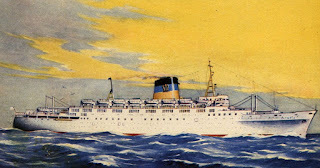 She was laid up at Piraeus in 1974, and the Greek Line suffered financial collapse the following year. In 1981, the Olympia was bought by Sally Shipping with the plan was to use the ship as both a floating hotel and for occasional Caribbean cruises. She was renamed Caribe and refitted with Klockner-Humboldt-Deutz diesels of 20,270 shp replacing the steam turbines. The Diesel engines would reduce her service speed to approximately 18 knots. In addition to the new power plant, extensive interior modifications were carried out. These modifications included but were not confined to: Removal of the Agean pool and converting that space into the Mermaid Bar, conversion of the Calypso Room, Card Room and Drawing Room into suites. The Derby Room and Taverna, aft of the Olympian Hall restaurant on restaurant deck was converted into a casino. One public room that remained untouched throughout her life was her gorgeous, paneled library on Promenade deck. When the hotel plan was cancelled she returned to cruising and was renamed Caribe I in 1983, in the Commodore Cruise Line fleet. The ship's original funnel had been replaced by exhaust pipes decorated in a framework design. In 1988, this was replaced by a more traditional funnel. In 1993 she was sold to Regal Cruises and renamed Regal Empress, and began sailing out of Port Manatee in the winters and New York City during the summers. She is now described as being only 14,500 GRT. Following the collapse of Regal Cruises, the Regal Empress was purchased by Imperial Majesty Cruise Line for their two-night cruise service to The Bahamas, the Regal Empress being cheaper to operate and carrying more passengers than their own ship OceanBreeze. The Regal Empress was featured in a late-2007 episode of the TV show MythBusters, where it was used to demonstrate that it is possible to waterski from the back of a cruise ship. In September 2008, the Regal Empress was removed from service to be used as an aid in the recovery of the aftermath of Hurricane Ike. She was laid up in Texas for about 2 months[when?]. She returned to service in December 2008. Her last voyage took place on March 6, 2009. On March 9, 2009 the Regal Empress was retired by Imperial Majesty Cruise Line. She was laid up for sale and inspection in Freeport, Bahamas until late March. It was reported by Maritime Matters on March 26 that the Regal Empress was sold for scrap. The Regal Empress was replaced by a newer ship, the MS Bahamas Celebration. The new ship carries on the same cruise itineraries as the Regal Empress did. However, the Bahamas Celebration is currently operating for a new cruise line, Celebration Cruise Line. The new cruise line is owned by the same company that had operated the Regal Empress. The Regal Empress departed Freeport in early April to sail to her final destination in Alang. Her voyage took over three months to complete. During her voyage, she was renamed the Regal Tmpress [sic]. She was beached on 24 July 2009. In October, scrapping began starting from the bow of the ship. The demolition of the ship was completed in early 2010.